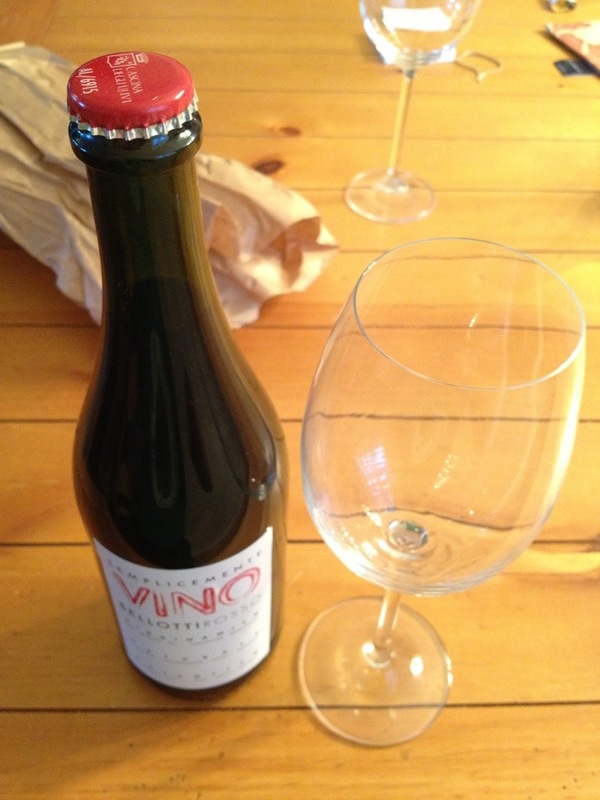 Check out the bottle cap action on this wine! 1. I forgot to give a score on camera, but this wine is legit. 91 points! 2. This wine was purchased for review at Craft Wine and Beer in Reno, Nevada. Do you want to hear Marcello play the clarinet? If so, what do you want to hear him play? Leave a comment, and let us know. Thanksgiving was yesterday, but I don’t have to go back to work ’til Monday. I’m pretty much okay with still calling this Thanksgiving. Since I am currently visiting my folks in Reno, Nevada, I was planning on doing a video with my Dad… Or even my sister, who is visiting from Atlanta, Georgia. I’ve been sneezing like crazy. My nose is hella raw. My throat is killing me. I look about as bad as the New York Jets right now. Instead of posting a video, I’ve decided to share with you the wines that we had with our Thanksgiving dinner last night. 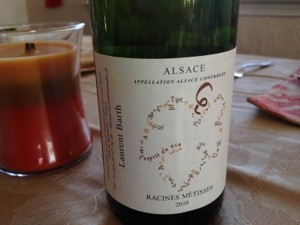 I’m a big fan of white wines from Alsace, France. This is a blend of Pinot Blanc, Sylvaner, Riesling, Pinot Gris, and Muscat. It’s got a light straw yellow color with a little frizzante action in it. The nose gives good fruit of green apples and pears with a good touch of minerality. On the palate, fruits of lime and pear skin are balanced out with a nice acidity, flinty minerality, and just a touch of residual sugar. I give it an 89. 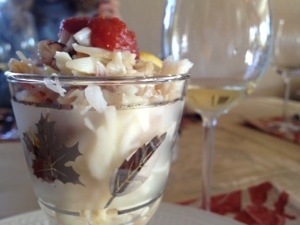 We had the white wine with some crab cocktail, which brought out a buttery apple flavor in the wine. 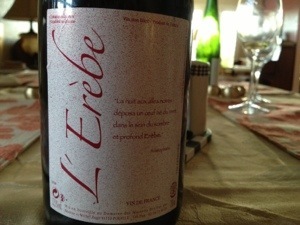 The L’Erebe is a natural wine from the Loire Valley of France. 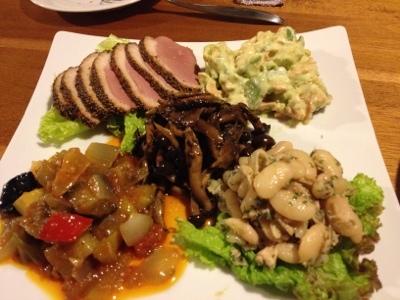 It is a blend of Cabernet Franc and Cot. I really enjoyed popping the bottle cap off of this one. This wine is a dark ruby-red. This wine has a funky nose of Earth and dark berries. On the palate, this wine brings the funk hard. Ripe red fruit. Strawberries. Raspberries. Cherries. 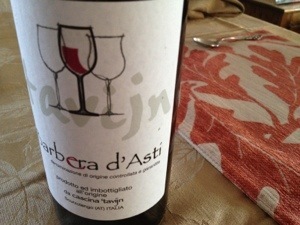 This Barbera is a nice, light, ruby-colored wine. It’s got an oaky, almost buttery, nose with a bit of cranberry and black pepper. The taste of this wine is rich and earthy, with blackberries and cherries. 89. This is a great wine to have with turkey. 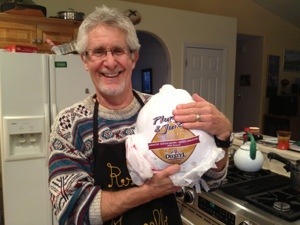 Here’s my dad and his turkey. Here’s hoping you had a happy Thanksgiving, everybody. If you took the time to watch Episode 51 of SRWBTV, you may recall that I spent quite a bit of time talking about Natural Wine. Although the term has been a hot topic among wine geeks for some time now, it wasn’t until my recent visit to Nagoya, Japan that I got a chance to really understand what Natural Wine really is. Aim and PB had been to a few of their tasting events in the past. Knowing that Kara and I love wine, they called up Joel from Peshico to see if they could arrange a tasting for us. Although Joel told them that Peshico was moving away from doing tasting events, he invited us down to the store to pick some bottles of wine. 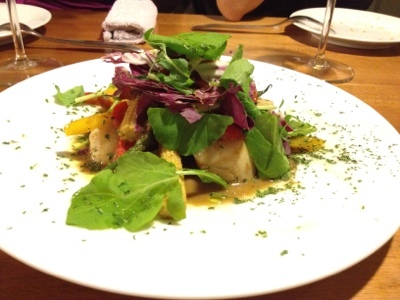 We could then head over to a local restaurant to have dinner and enjoy the wines while Joel described them. The term “Natural Wine” is not regulated by any governing body, the way that “Organic” is. Most Natural Wine producers will not include the term on their label. This makes it tough for us American consumers to take hold of. Natural Wine is not just “Organic” or “Biodynamic”. Those labels refer to how the grapes are farmed. Many Natural Wine advocates will argue that after these organic grapes are farmed, they can be treated in very un-natural ways to make wine. 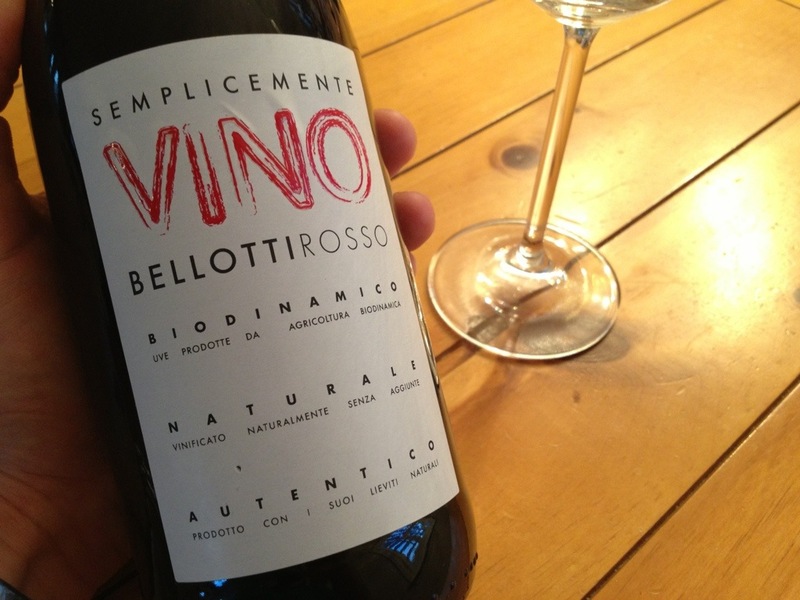 The best way that I can describe Natural Wine is that it is a philosophy in winemaking. When grapes hang from vines, as they ripen, natural yeasts will collect on the grapes. These indigenous yeasts will consume energy from the sugar in the grapes through a process called alcoholic fermentation, a natural process in which yeast convert sugar into carbon dioxide and alcohol. You may have heard stories of birds eating grapes that have fermented on the vine, gotten drunk, and then flown into windows. Essentially, the alcohol produced here is wine, the way that nature intended. 1. Grapes are organically grown (with or without certification). 4. Wine is fermented on their natural occurring yeasts. 5. No sugar is added during the winemaking process. 6. 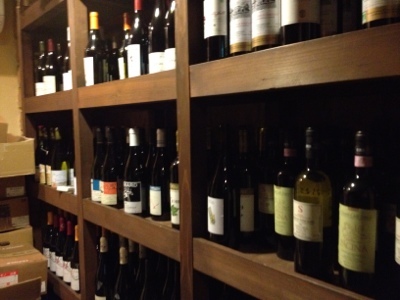 Wines are rarely filtered or fined. 7. Very little, if any, sulfites are added during the process. A quick word on sulfites. 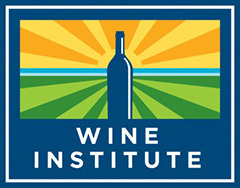 There is no such thing as a sulfite-free wine, because sulfites occur naturally in grapes. While sulfite allergies do exist (the FDA estimates 1% of the population suffers from sulfite sensitivity), the compound seems to get a bad rap from the general public. Some folks like to blame sulfites for their hangovers, when alcohol is the more likely culprit. Some folks claim that the sulfites in red wine gives them headaches, so they stick to white. The reality is that white wine contains much more sulfites on average than their red counterparts. If you are convinced that you have a sulfite sensitivity, you could see an allergist… Or you could do the food test. Do you have reactions to dried fruits? If so, maybe you do have a sulfite sensitivity… Considering that they contain about 10 times more sulfites than wine. I like the idea of being a minimalist when it comes to making wine. It is not the goal of the natural winemaker to make a wine that is consistently the same from one year to the next. It is the goal of the natural winemaker to produce a wine that best expresses the grapes grown in one place during the course of one year. 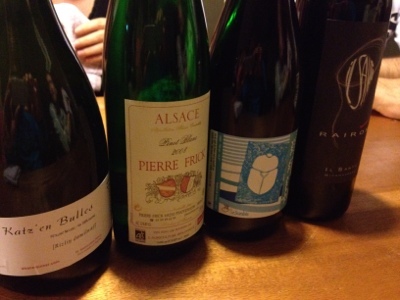 Just like the weather, Natural Wines can vary quite a bit from one year to the next. In a sense, you could consider Natural Wine to be journal that nature has written during one growing season. 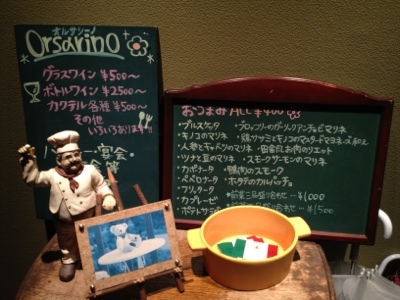 You know… This blog is kind of like a journal. Does that mean that Natural Wine is Rad? 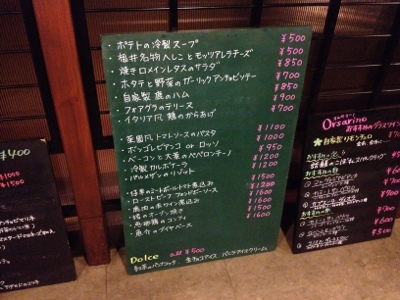 Tons of other dope foods. 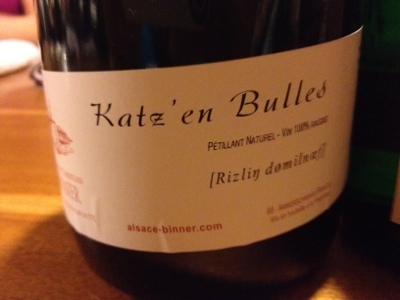 Christian Binner 2009 Katz’en Bulles: This sparkling Riesling from Alsace, France brought aromas of apple and lavender. There’s a good lemon/lime acidity to go with notes of honey and menthol on the palate. A great start. 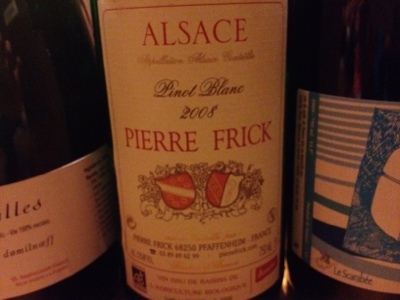 Pierre Frick 2008 Pinot Blanc: This Alsacian white is a crisp little number. Apple Sauce. Honeysuckle. Lemon. Crisp to the Hella. 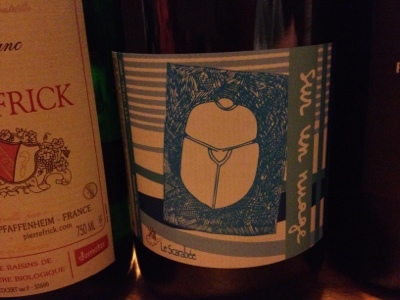 Le Scarabee 2009 Sur un Nuage: This is a red blend of Grenache and Carignan from the Roussillon region of France. Good notes of strawberry, clove, and cinnamon on the nose. Good flavors of Earth and strawberries. Good tannic mouthfeel. You could say it’s good cubed… And that’s hella good! 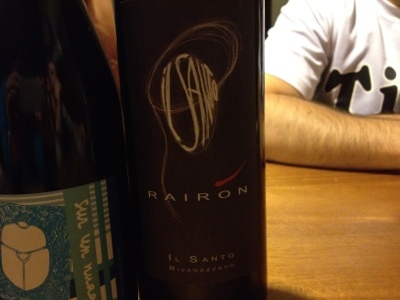 Podere il Santo 2006 Rairon: 90% of this Italian red from Lombardia is made of a grape called Uva Rara. That translates to Rare Grape! The other 10% is Barbera. There’s a great nose of cherries, blueberries, and soil. The palate matched the beautiful nose on this wine. Everyone at the table was a fan. I’ve gotta say that ever since this dinner, my mind has been obsessing on Natural Wine. I was really pleased with how fresh, different, and delicious these wines were. I’m certain that there are some clunkers out there, but this dinner was a shining example of how good Natural Wine can be. 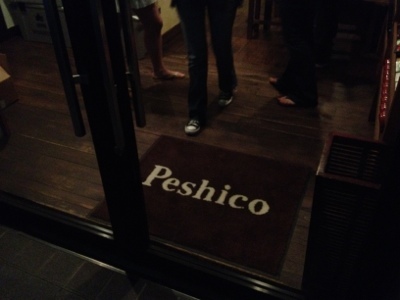 I want to thank Joel at Peshico for being such a great host, and for sending me a whole bunch of info on the wines we drank that night. If you get a chance, don’t be afraid to give Natural Wine a try. PS – For more info on Natural Wine, check out MoreThanOrganic.com.